United States Ambassador to the United Nations Nikki Haley listens during a United Nations Security Council emergency meeting on Saturday. The US ambassador to the United Nations told the Security Council on Saturday that the United States is ‘‘locked and loaded,’’ ready to launch another military strike if the Syrian government ever uses chemical weapons again. ‘‘I spoke to the president this morning, and he said, ‘If the Syrian regime uses this poisonous gas again, the United States is locked and loaded,’’’ Nikki Haley said at an emergency U.N. Security Council meeting called by Russia after the U.S. and allies struck three targets in Syria. ‘‘When our president draws a red line, our president enforces the red line,’’ she added, echoing earlier warnings that Western powers could strike again. 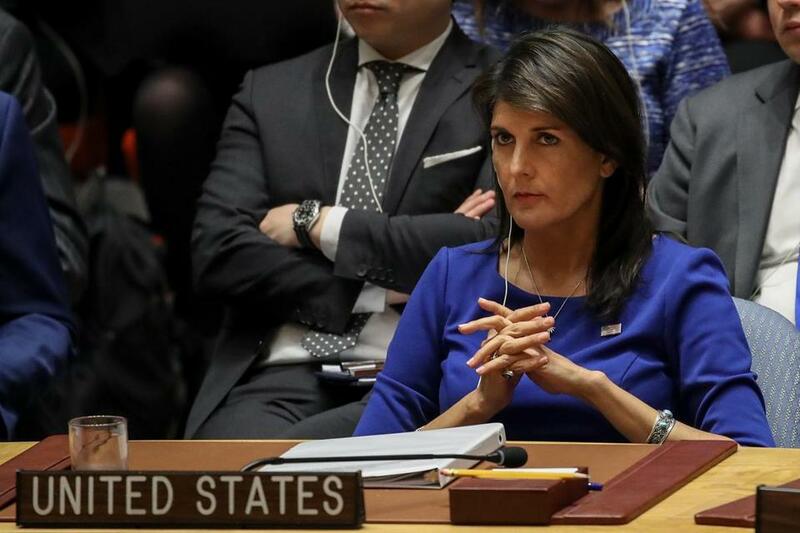 Haley’s message came after her Russian counterpart, Vassily Nebenzia, said he would ask the Security Council to condemn the pre-dawn military strikes on Syria by the United States, France and Britain - calling the attacks a violation of international law and the U.N. Charter. But one major worry appeared to ease: That the coordinated attacks by the United States, France and Britain late Friday could have set off a direct confrontation with Syria’s most powerful military partner, Russia. At the Pentagon, the director of the Joint Staff, Lt. Gen. Kenneth McKenzie, said the more than 100 missile strikes delivered a blow late Friday to the ‘‘heart’’ of Syria’s chemical weapons network. He acknowledged, however, that Syria retained ‘‘residual’’ capacity, but gave no details on the scope of what could be left. The strikes were seen as a middle ground between a limited and largely symbolic strike - such as last year’s the U.S. missile attack - and a large-scale assault that could either destroy Syria’s chemical weapons or weaken Bashar al-Assad’s grip on power. The Pentagon said a barrage of more than 40 Syrian surface-to-air missiles had ‘‘no material effect’’ on the allied attack, which McKenzie said struck their targets. None of the more sophisticated air defenses that Moscow has positioned in Syria were employed, he said. A Trump administration official later told reporters that none of the 105 missiles fired were hit by Syria’s Soviet-era antimissile fire - contradicting claims by Russians that Syrian units intercepted incoming missiles. McKenzie described one site, the Barzah Research and Development Center, near Damascus, as a ‘‘core’’ facility for Syria’s chemical weapons program. ‘‘They lost lot of equipment. They lost a lot of material, and that’s going to have a significant effect,’’ McKenzie told reporters at the Pentagon. In the wake of last weekend’s gruesome attack, some U.S. officials advocated a larger, and therefore riskier, strike than the limited action Trump ordered in April 2017, also in response to suspected chemical weapons use. That attack involved 59 Tomahawk missiles fired from two U.S. warships in the Mediterranean Sea. It fulfilled Trump’s vow that chemical weapons are a ‘‘red line’’ that he, unlike his predecessor Barack Obama, would not allow Assad to cross. But the airfield targeted by the Pentagon resumed operations shortly after the attack and, according to Western intelligence assessments, chemical attacks resumed. Since last year’s strike, multiple chemical attacks have been reported in opposition areas, most of them involving chlorine rather than the nerve agent sarin, as was used in 2017, suggesting the government may have adjusted its tactics. Russia’s military had threatened to shoot down any U.S. missiles that put Russian lives at risk. Russia could also fire at the launch platforms used - potentially U.S. planes or ships. Russian officials had said U.S. and Russian military staffs remained in contact regarding Syria, even as Russian media carried stories in recent days about the potential outbreak of ‘‘World War III’’ as a consequence of a U.S. airstrike against Assad. The Washington Post’s Louisa Loveluck in Beirut, Anton Troianovski in Moscow, Simon Denyer in Beijing, and Brian Murphy and Paul Sonne in Washington contributed to this report.